Hub: Find it yourself. Or better yet, learn to do without. Garth: Yeah. We're both gettin' old. Hub: Fixin' to die any time. So, if we kick off in the middle of the night, you're on your own. I find that the quality of family films has diminished lately. All too often, these efforts are either too childish for adults or too intense for children. However, in the tradition of great classics from the 1930s and '40s comes Secondhand Lions, a family film that proves greatly entertaining for all ages. Not only is it an intelligently written, passionately crafted story, but it also conveys profound messages without becoming too heavy handed. The amiable story begins as 14-year-old Walter (Haley Joel Osment) finds himself forced to spend the summer at his great uncles' farm in Texas. Walter's manipulative mother, Mae (Kyra Sedgwick), promises him she will be back in just a few weeks, but he has heard her lie to him far too many times. Uncle Hub (Robert Duvall) and Uncle Garth (Michael Caine) are bitter, peculiar, and completely unfamiliar with how to care for a youngster. Their preferred form of entertainment is warning off door-to-door salesmen with shotgun blasts. Though simple folk, Hub and Garth appear to have been blessed with an abundance of money, and Walter soon hears rumors from the townspeople that the duo may have acquired their wealth from robbing banks or stealing from the Mafia. Nothing is certain, except for the fact that Hub and Garth once disappeared from Texas for a period of 40 years. As Walter spends more time with the old men, he begins to discover a tenderness beneath their crusty exteriors. He soon confronts Garth about their elusive past, at which time his uncle begins to weave elaborate tales of the adventures he and Hub shared in Africa. These stories are depicted as epic fantasy sequences, where a swashbuckling young Hub does battle with a dangerous sheik and rescues a princess named Jasmine. Though Walter has little faith in the validity of these stories, they give him an optimistic escape from the cynical world that his mother has provided for him. As time passes, Walter begins to develop a special and unique relationship with his uncles. Though the plot is simple and straightforward, McCanlies has several interesting tricks up his sleeve. The fantasy sequences in particular provide thrills in addition to breaking up the conventional narrative. It is almost as if McCanlies has written one and a half movies and managed to tie them together seamlessly. These action segments are presented in a playful manor, as they are imagined through the eyes of young Walter. It could be argued that they do not fit well within the fabric of the story, but I honestly could not imagine the film without them. Not only are they fun and exciting, but they also add depth to the characters. 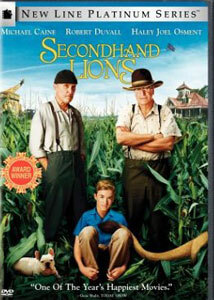 Much of the appeal of Secondhand Lions can be attributed to the fantastic performances from the three leads. Unsurprisingly, both Caine and Duvall exude an innate knowledge of their craft, yet it has been a while since I have seen either of them deliver such honest, heartfelt performances. It would have been easy for less experienced actors to overemphasize the personalities of Hub and Garth so much as to reduce them to unpleasant codgers. However, these seasoned veterans demonstrate tremendous erudition and restraint in creating simultaneously credible yet affable personalities. It would be quite intimidating for any actor, much less a child, to interact with such accomplished performers, but Haley Joel Osment blends right in, bringing an equal level of talent to his role. Appearing all grown up and void of his child-star persona, Osment proves that his tour-de-force performances in The Sixth Sense and A.I. were no flukes. I expect to see a long and prosperous career from this gifted talent. The crowning achievement of this production is Tim McCanlies' screenplay. It is rare that the Hollywood system does not obliterate the integrity of such an earnest piece of work, yet, McCanlies fought tooth and nail with major studios to keep his vision intact. Through McCanlies' struggle to preserve his artistic intentions, the genuine, heartfelt qualities of the screenplay remain wholly evident in the finished product. Also directing the film, McCanlies shrewdly blends humor and drama into an emotional tale of empathy. While overall a bit sappy, Secondhand Lions is a rare family film that will actually appeal to the entire family rather than one narrow age group. Image Transfer Review: The 1.85:1 anamorphic widescreen image transfer is nice, yet somewhat disappointing by current standards. The picture is often abundant with compression artifacts, no doubt due to the fact that a pan-and-scan version has also been included on the second layer of the dual layer disc. Overall, the visuals are bright and vivid, thought slightly wanting in detail. While certainly enjoyable and far from overtly distracting, this transfer reminds me of what DVD looked like five years ago. Audio Transfer Review: The Dolby Digital EX soundtrack has been optimized for home theater, and is brazenly aggressive and loud. I found it to be a touch excessive and toppy at my normal listening level, yet thankfully distortion free. The +4 offset seems to have compromised the dynamic range a bit, and the dialogue sounds slightly pushed forward as a result. Otherwise, the soundtrack is fabulous, boasting a creative yet fully realistic soundstage. Even during moments of extreme quiescence the soundfield is wide and spacious, drawing the viewer into the heart of the film with the subtle sounds of bugs, wind, and other natural elements. The EX encoding further helps to fill up the soundstage, with several moments of aggressive back surround presence such as the moment where a plane zooms in and out of the rear channel. The music packs a tremendous wallop, particularly during the action based fantasy sequences, which are also backed by strong bass. Overall, this is a tremendously exciting EX soundtrack with an aggressive nature that proves pleasantly surprising for a family film. Extras Review: Side A begins with a feature-length commentary by writer/director Tim McCanlies. The filmmaker gives quite a verbose and exuberant analysis of his film, covering a wide array of topics without forgetting to give credit where credit is due. This is an entertaining and enlightening commentary with few dull moments. Flipping the disc over to Side B, we begin with an extensive collection of deleted and alternate scenes. Over 41 minutes worth of material is featured, including nine deleted scenes and an alternate ending, all of which contain an optional commentary by McCanlies. Several of the scenes are alternate versions of what we see in the film, while others are moments that were fully excised from the final product. All 41 minutes are a joy to watch, and not merely the type of scenes where I roll my eyes and think, "Well, I'm certainly glad they cut this!" While these scenes would have made welcome inclusions in the final film, I agree with the decision to cut them for pacing purposes, as McCanlies confirms in his commentary. Boasting anamorphic widescreen transfers with 5.1 sound, this is an excellent presentation. The first of two documentaries is Secondhand Lions: One Screenplay's Wild Ride in Hollywood. This is not only an excellent look at how McCanlies struggled to get his screenplay green-lighted, but also his determination in keeping his vision safe from the interference of studio big wigs. The second documentary is On the Set with Secondhand Lions, which is a more conventional promotional piece featuring behind-the-scenes footage and interviews with the cast and crew. While fairly formulaic, there are many interesting and revealing moments, such as the training of the animals, a look at the casting process, and the approach to creating the fantasy sequences. Both documentaries are presented in anamorphic widescreen. Next is a featurette titled Haley Joel Osment: An Actor Comes of Age. While mostly consisting of routine interview material, it is interesting to hear the accomplished young actor discuss his approach to the acting process. Also included are visual effects comparisons for two brief scenes. Split screen comparisons offer a glimpse at the finished film alongside the principal photography, which mostly consisted of blue screens. With a dismal running time of less than two minutes, my disappointment in the brevity of this section outweighs my enthusiasm over its content. The theatrical trailer is presented in anamorphic widescreen, with 5.1 sound. Also included are seven TV spots, which have been divided into two sections. The first section contains three TV spots geared towards a younger audience, while the second section contains the remaining four spots, aimed more toward adults. Rounding out the special features are anamorphic widescreen trailers for Elf and Laws of Attraction, as well as a DVD-ROM online feature. Though Secondhand Lions may be a bit schmaltzy, it succeeds where many similar films falter, proving to be engrossing entertainment for all ages. The DVD of this enjoyable film has been given admirable treatment with an outstanding Dolby Digital EX soundtrack and a worthwhile collection of special features.